← Snow, Great Backyard Bird Count, and Ridgefield Wildlife Refuge! So at my Wednesday Gathering time, we alla time have one Valentine’s Day pa‘ina; u know, jass like in school, everybody brings valentine da kine foa everybody else. I stay from Hawai‘i, yeah, so I like do Hawaiian kine stuffs. 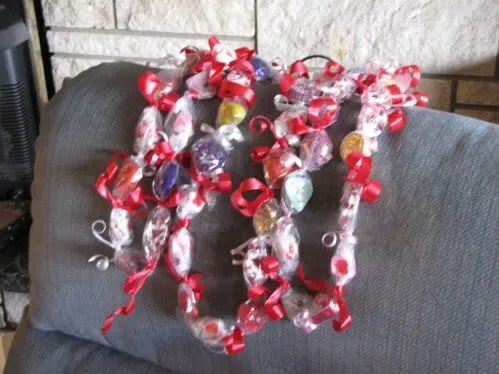 So dis yea I wen ordah candy lei tubing from East Coast Tropics; I had some tubing from da lass time I wen ordah from Lovena, but auwe, no could findum! So aftah frantically searching chru da hale wit no luck, I wen ordah moa, pleading wit Lovena foa sendum wikiwiki cuz stay Valentine’s Day in just one week! East Coast Tropics nō ka ‘oi! Da tubing wen arrive in jass chree days, and I wen start nā lei. Had foa do fourteen of dem! 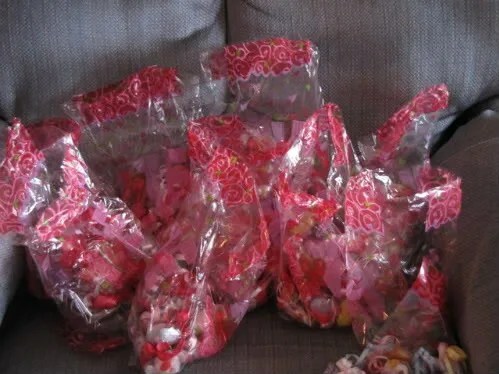 I had one bambucha bag of Valentine candy. So I wen sit in Nolemana’s chayah and wen spend hours doing ’em all! 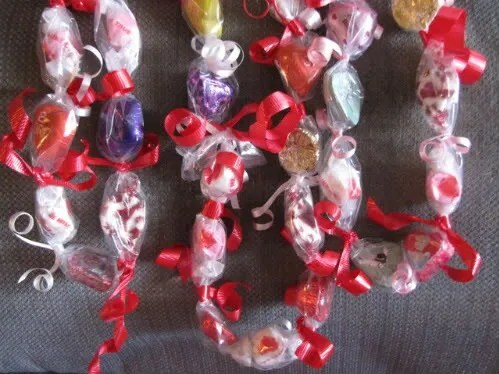 Had foa cut and curl alla ribbon, put da candy insai alla tubing foa all fourteen of dem. But finally was pau, and dis wat dey looked like aftah (just a few in da photo). Sorry small kine blurry. I wen geev each one Hawaiian style wit one hug and one honi foa each wahine, and Nā lei were one big hit. Pau da pa‘ina, we all wen holoholo ka‘a to Hula Boy Charbroil down da road in Vancouver. Was choke fun seeing all my friends wearing alla lei I wen make foa dem! Was fun day and I stay so hau‘oli dat I wen do dis foa my friends! Mahalo nui, Lovena, foa gimme so much wikiwiki-ness wit my ordah! Ho da nani! I like da colah ribbon you used. So good fun foa make da kine lei. Used to have one asian grocery stoah dat sold all kine japanee, chinee, korean food. Dey had da kine seemoi!! Stay gone alreedy da stoah, but so good fun foa shop dea! Ohh those are so FUN!!! i wanna stick LOTS of stuff in tubes now. Hey, Maybe I can skinny-down a skein of yarn? That would make a neat present. Too good, Moki-chan! You wen mek all dem lei so fas!